Abandonment is an action that implies being left behind or being abandoned. When we hear the word abandon we immediately think of somebody leaving or somebody left behind as we relate this word to that. Others think of an empty property that was just left there by its owner who never returned. You may also see notice memo. A lot of things can be thought of when the word abandon or abandonment is mentioned. There are also slight variations to its meaning depending on the type of situation is it used on. Right now we will specifically deal with abandonment notice. 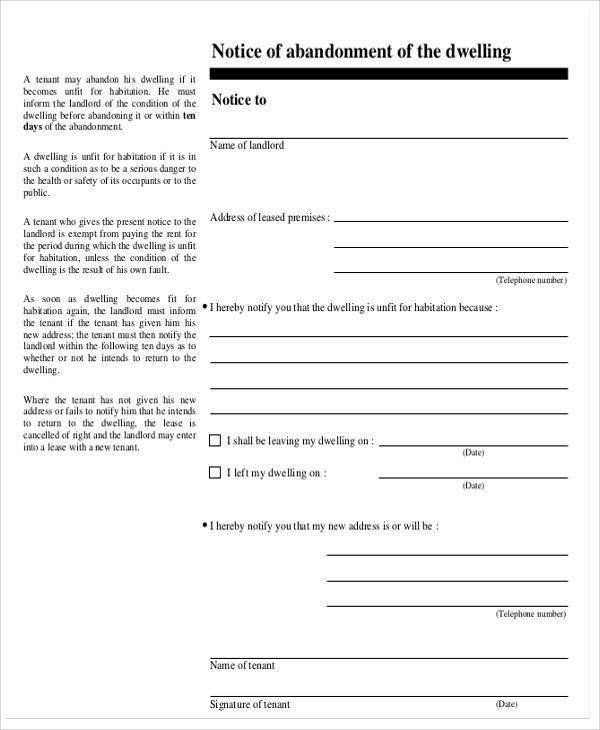 To help us further with knowing what it is are abandonment notice templates in different format and for different uses. You may check them out below. What Is Meant by a Notice of Abandonment? 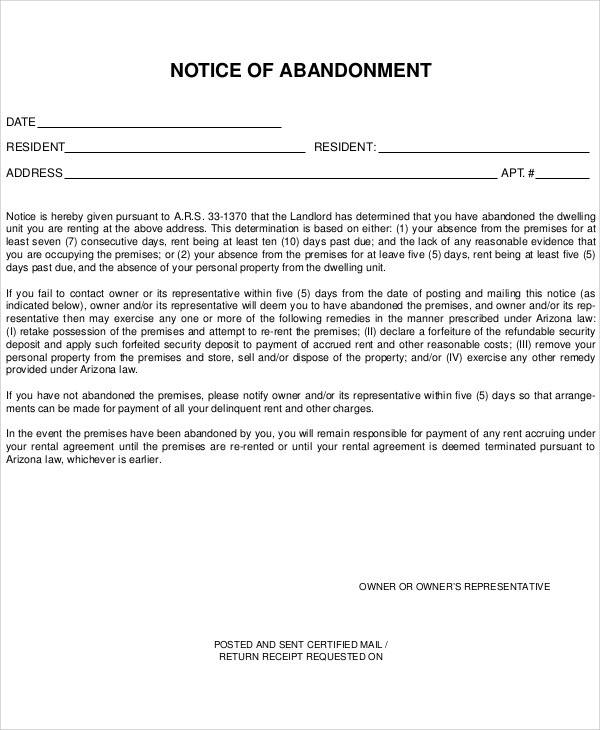 Abandonment notices are formal and legal ways of ending a contract on a property, such as a lease agreement contract or rental contract agreements, provided that the said property has been abandoned or left behind by the lessee or the entity who rented it. This is to make way for the business to keep on running with new tenants. 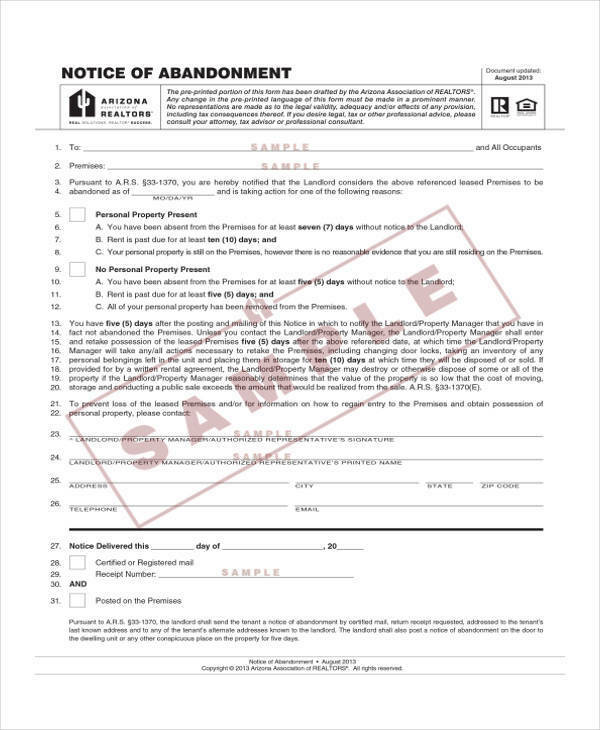 Oftentimes abandonment notices are used in different things aside from abandoned properties, just like in abandonment of one’s employment or abandonment of one’s responsibility. 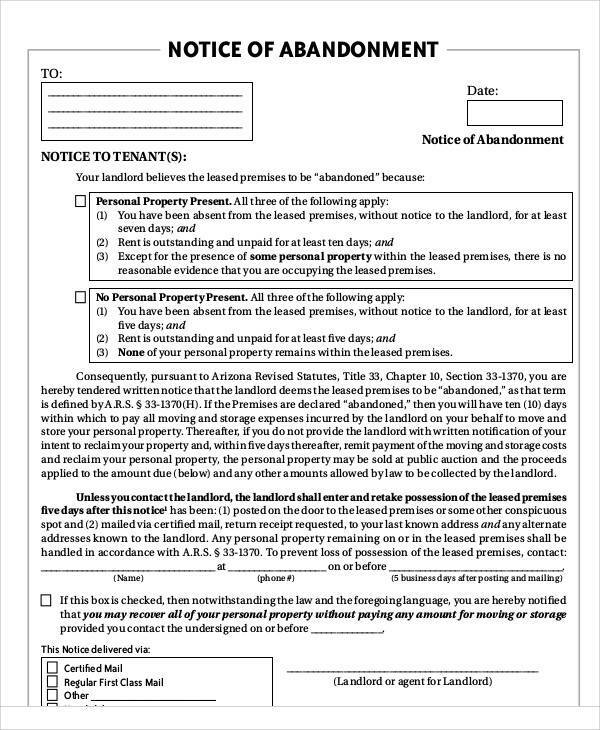 An abandonment notice is issued to notify an individual or entity that a particular property or position will no longer be theirs to keep if they do not show up or explain themselves as to why they left it. If no responses are done within the given notice period, the landlord or tenant will have all the rights to end or terminate whatever contract or agreement they have with this certain entity or individual. What Are the Types of Abandonment Notice Templates? You may also like cancellation notice samples and templates. 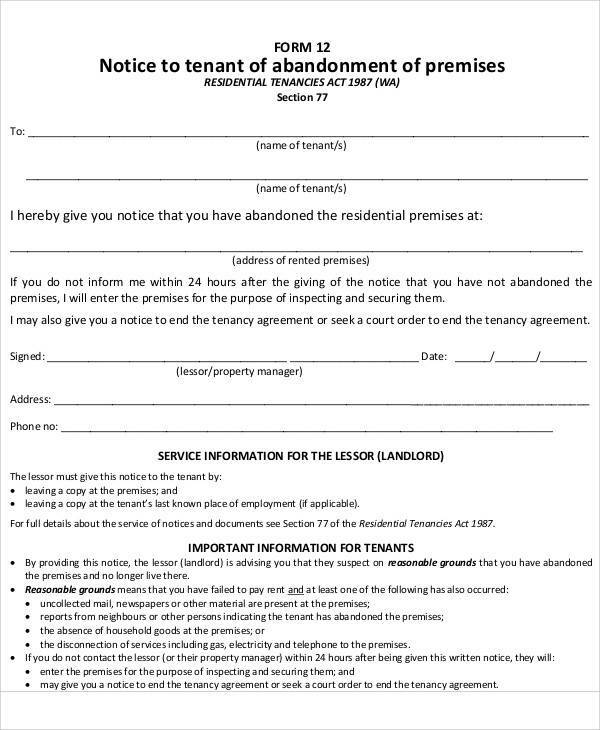 If the tenant or a rental or leased property is no longer making the payments required of them, then the landlord may issue a lease or rental abandonment notice to notify the tenants what is going to happen if they don’t respond within the said period of time. It can also be issued when the landlord believes that the tenant of their property has already abandoned it. Using a lease abandonment notice or lease termination notice for such reason will be a legal way of ending their contract or agreement. This is perhaps the most common abandonment notice you have ever heard of as this happens in the workplace. 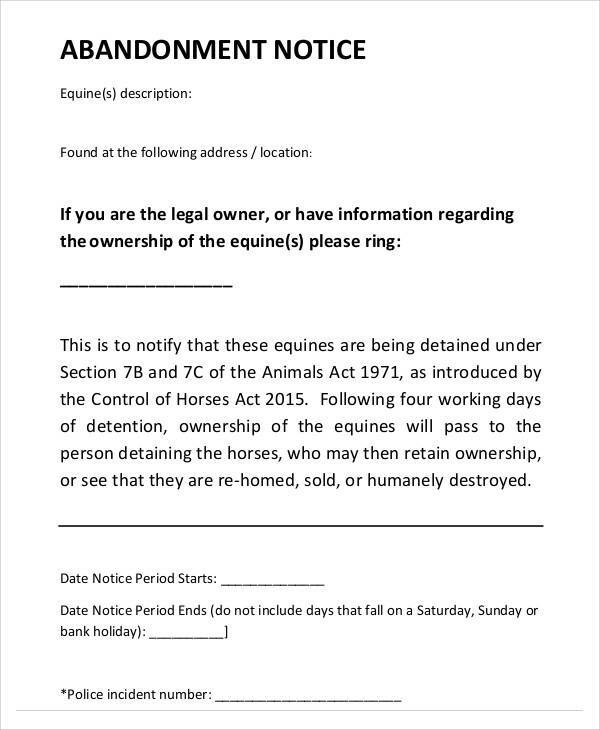 One of your workmates might have been issued this type of notice because they are always not there. 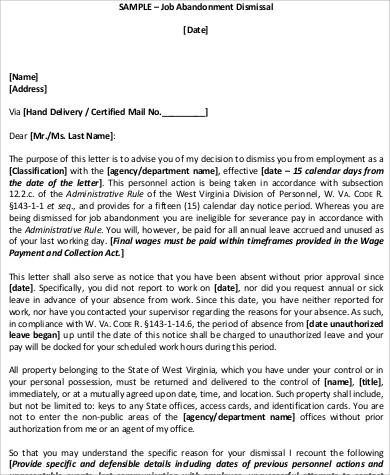 A job abandonment notice is issued by an employer to its employee who failed to notify them and give them appropriate reason for not being able to come to work as scheduled. It usually ends up as an employment termination notice, especially if the employee fails to respond to the said notice within the given period of time. 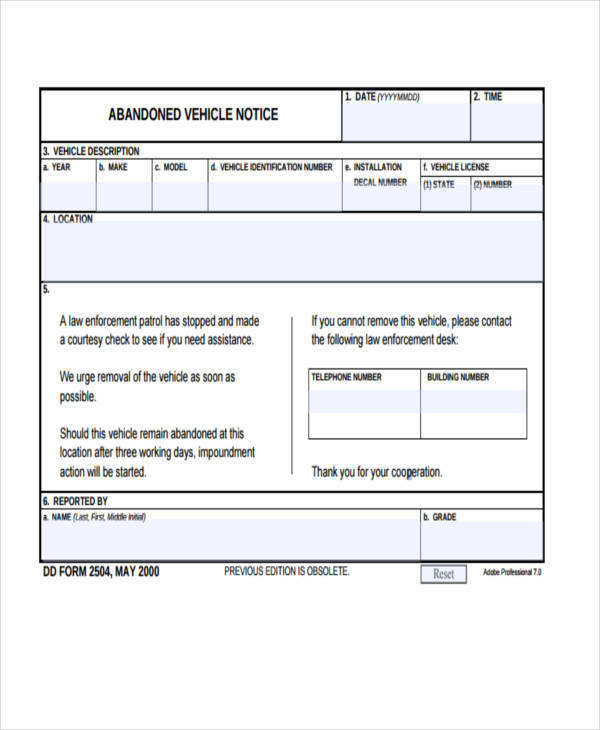 If you need any samples or templates for every type of abandonment notice presented above, then you may want to visit our website. We also have other notice samples and templates that might be interested in, like bulk sale notice samples and templates, separation notice samples and templates. 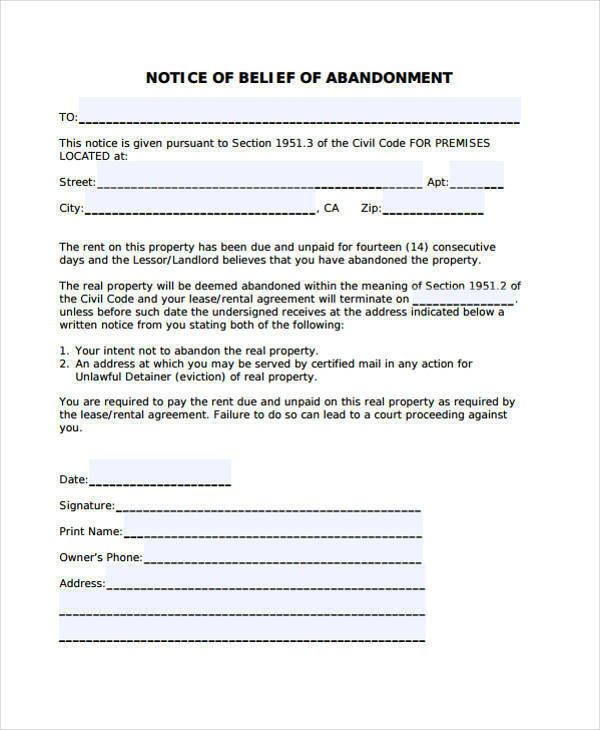 What Are the Components of an Abandonment Notice? Another important thing that you need to know about abandonment notice templates are its components. If you don’t know what one includes, then there are chances that you might not have them stated in the notice that you make. This can become a serious problem in the future and might even be used against you. So if you are planning to make an abandonment notice of your own or if your just simply trying to learn about it, you will need to know its components. 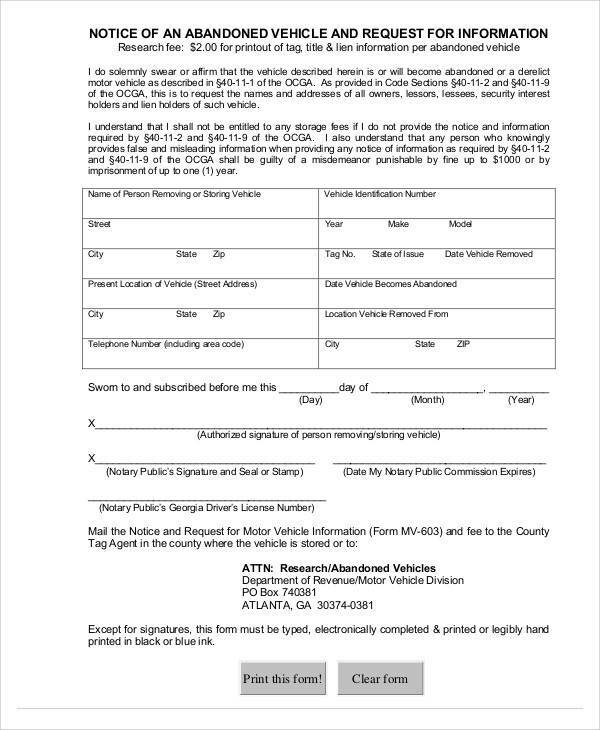 You may also see sample notice letters. 1. The heading/title – When issuing a notice, the title or the header is very important. It should be written in bold and should be easily visible by anyone who reads it. 2. The reason why the abandonment notice was issued – This includes that triggering factor or what made the landlord think that the property has been abandoned or what made the employer think that the employee has abandoned their duty. 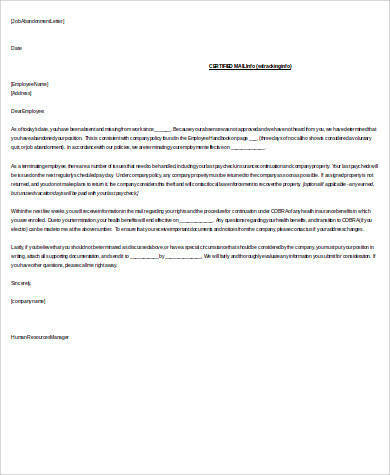 You may also like final notice letter download for free. 3. The name and address of the property that was abandoned – This refers to the exact or complete address where the abandoned property can be found and not necessarily the address of the property owner. If the property is part of big apartment complex, then the specific floor and room number should also be included. You may also check out employee warning notice samples. 4. 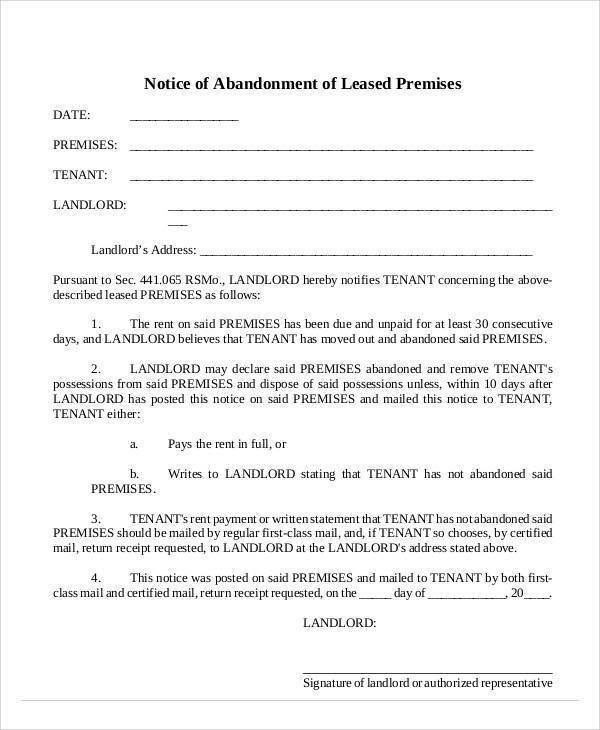 The name of the tenants who abandoned the property – The name of the tenant here refers to the person to whom the landlord was in agreement with regarding the rental of lease of the property, and not the person or entity who are actually using it in the event that the tenant had somebody else occupy it. 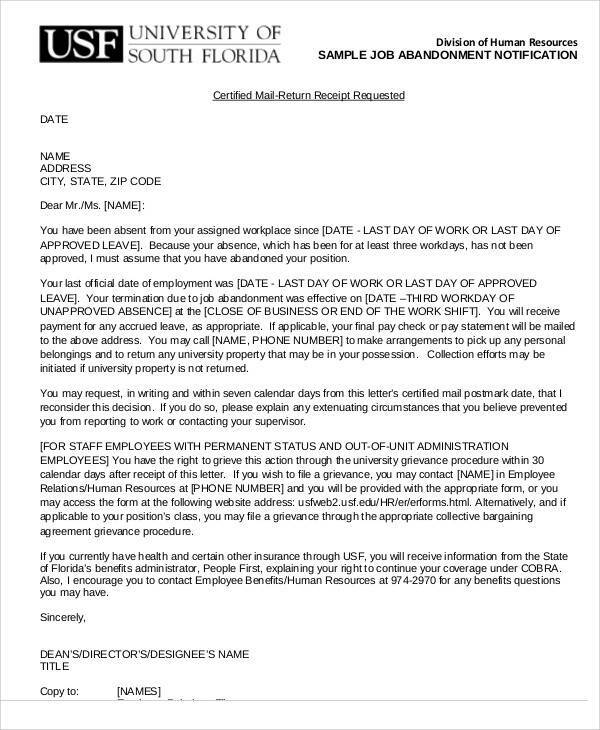 In case of an employment abandonment notice, the name of the employee who abandoned their work. You might be interested in 2-weeks notice samples. 5. The date when the notice was issued – This date should be clearly stated as this will be the starting date of when the notice will take effect. 6. The number of days notice – How many days does the landlord allow the tenant to contact him and explain themselves or reclaim the property? It depends on what has been agreed on by the landlord and the tenant and that should be the number of notice days written on the abandonment notice. You may also see useful sample late rent notice templates to download. 7. What needs to be done with regard to the notice – The landlord or issuer of the abandonment notice may leave instructions on what the tenant needs to do to contact them regarding the abandoned property. 8. Who the tenant needs to contact – The name of the person to be contacted as well as their contact details and available time should be included in the notice. This is regardless if the tenant or employee who did the act is still interested or is planning to contact them or not. 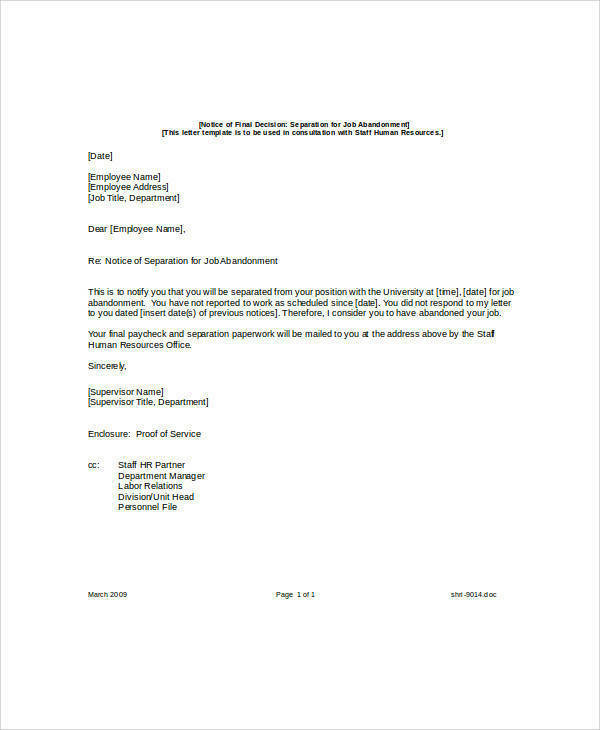 You may also like sample 30 day notice letters. 9. The name and signature of the property owner or issuer of the notice – Usually positioned at the bottom part of the last page of the notice, the name of the real owner of the property or the entity to whom the tenant was in agreement with should be included. They should also affix their signature and put the date when the document was signed. Sometimes, even after issuing a notice, you still need to issue another notice until you get to issue the final notice. The process varies from state to state and depending on the situation that one is in. Notice writing samples and templates will provide you with an idea on what other notices are like. You may also learn from a variety of related topics with samples and templates like late rent notice templates, notice of termination due to false employee information, and sample DMCA notice templates. It’s pretty easy to say that you will issue an abandonment notice so that you can end your contract or agreement legally and have the property rented or leased to another again. Well, that is how it is being explained in a lot of books and sources online because what we usually look for is about what an abandonment notice is. It doesn’t really tell us what should be done in case a tenant abandons a property until we actually search for it. The truth about what happens and what you need to do when a tenant abandons a property are listed below. 1. First, make sure that the property is really being abandoned. If you have not seen your tenants in that property or if they have not been making any payments at all, then be suspicious. You can either contact them, ask their neighbors, or just check from the windows if anybody is there. You may also see notice of cancellation letters. 2. If you have reached them by phone and confirmed that they are really not coming back, then have them write an abandonment notice that they signed. 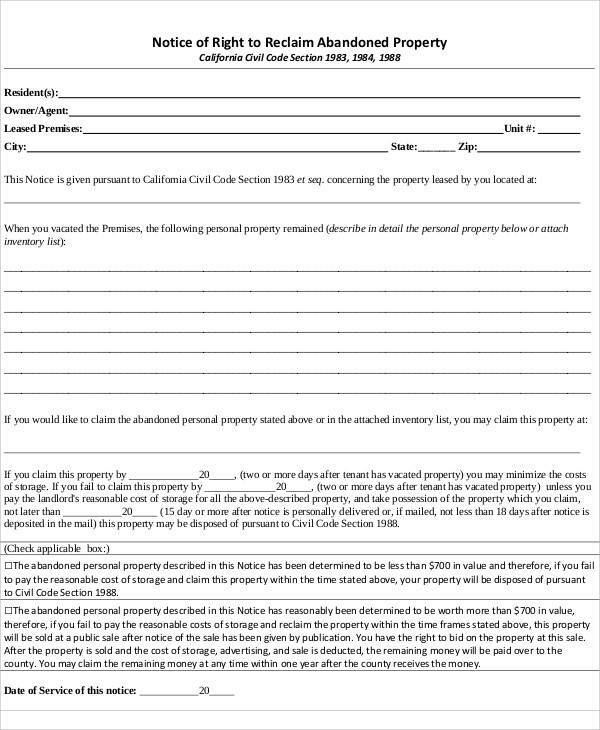 This is the only way for you to be able to enter the property legally. 3. You should always remember never to enter the property even if are sure that your tenants are not coming back, unless you have the signed document that they are abandoning it for good. It’s not that simple as you think because you might still be violating the law. You may also like 30 day notice templates. 4. If you are not sure if the your tenant has truly abandoned the property, the best thing that you can do is safeguard their belongings. Again, you cannot just enter the property whenever you want to. 5. And so if there are still no signs of your tenant returning to the property, then you will need to get legal advice or legal permission to be able to enter it. Once you have that done, you will need to follow a series of steps in order to reclaim the property and have it leased or rented to other people who are interested. You may also check out notice to quit samples. It’s pretty difficult to handle lease or rented properties, especially if you come across tenants who just leave without saying a word or without any notification. Talk about having bad luck on your side. But if you follow the right steps in order to break free from such situation, you will surely get your property back without committing any criminal offenses. To learn more about other related topics, like rent notice samples and templates, eviction notice templates, and 30-day notice samples and templates, feel free to check out our website.